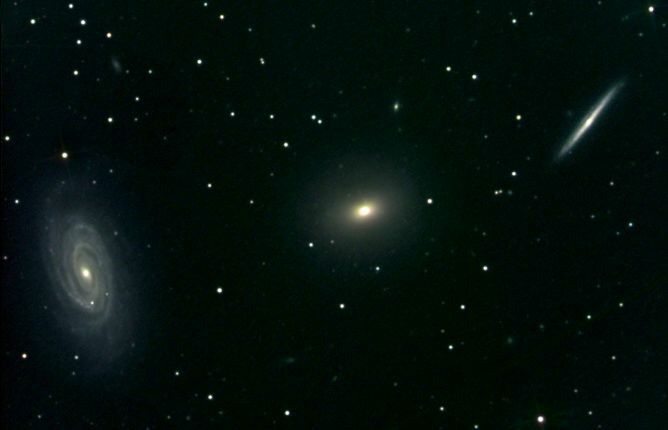 Explanation: This intriguing trio of galaxies is sometimes called the NGC 5985/Draco Group and so (quite reasonably) is located in the northern constellation Draco. From left to right are face-on spiral NGC 5985, elliptical galaxy NGC 5982, and edge-on spiral NGC 5981 -- all within this single telescopic field of view spanning a little more than half the width of the full moon. While this grouping is far too small to be a galaxy cluster and has not been cataloged as a compact group, these galaxies do lie roughly 100 million light-years from planet Earth. On close examination with spectrographs, the bright core of the striking face-on spiral NGC 5985 shows prominent emission in specific wavelengths of light, prompting astronomers to classify it as a Seyfert, a type of active galaxy. Not as well known as other tight groupings of galaxies, the contrast in visual appearance makes this triplet an attractive subject for avid astrophotographers.